Russian nationalist Martsinkevich found guilty of inciting hatred and enmity | Russian Legal Information Agency (RAPSI). MOSCOW, June 20 (RAPSI, Yevgeniya Sokolova) – Moscow’s Babushkinsky District Court has found infamous Russian nationalist Maxim Martsinkevich guilty of inciting hatred and enmity, hooliganism, robbery and property destruction, RAPSI learnt in the court on Tuesday. Investigators believe that Martsinkevich, a.k.a. Tesak (Hatchet), and his supporters under pretense of drug interdiction attacked people in 2013-2014 in Moscow using electro shockers, gas sprayers and metallic pipes, leaving several people traumatized and one person dead. These attacks were allegedly connected to a movement “Occupy-Narcofil’ay” organized by Martsinkevich against synthetic cannabis (a.k.a. spice) dealers. 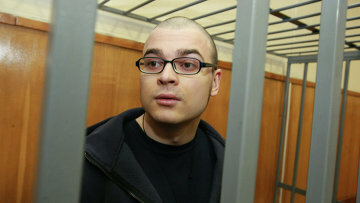 Martisnkevich and nine other people have been charged with extremism, hooliganism, robbery and property destruction. Martsinkevich, one of the more well-known Russia nationalists, has a history of clashes with the law. In 2014, he was sentenced to five years in prison for publishing extremist content on the Internet. He has already been convicted of publishing online a video of staging an execution of a “Tajik drug dealer” and extremist statements. He has received 3.5 years in prison in two cases taken together. 16:38 27/06/2017 Moscow’s Babushkinsky District Court has found infamous Russian nationalist Maxim Martsinkevich guilty of inciting hatred and enmity, hooliganism, robbery and property destruction.